No two cups of tea are perfectly alike. That's part of the allure that keeps tea aficionados Charles Andrews and Erik Dunham passionate about the age-old beverage. The two founders of the Andrews & Dunham Damn Fine Tea company also love the romance of tea, its rich history, and (of course) the taste. They take their tea very seriously and offer only a few select varieties -- but not in an exclusionary way. Charles and Erik strive to make their fine teas accessible and enjoyed by anyone, so they can share their love of tea with the world. The individual characteristics of Damn Fine Tea’s custom-blended varieties are distinct yet subtle, like the variations in fine wine. Carävan is a bold, smoky black tea from China; Assam is refined and gentle but with a hearty resiliency; and Double Knit Blend is rugged and modern. Each blend is sold loose and comes in a tin designed by graphic artists. Flavor is important, and so is the harvesting method. Charles and Erik aren’t interested in high volume, industrialized tea production. They only offer teas made with leaves that were grown, picked, and processed using traditional methods. Most of the work is done by hand, with minimal alterations and without any added herb blends or flavorings. It’s all part of the artisanal delivery and exquisite taste. You know what's fantastic? Great tea. Charles and I love tea and we love sharing our favorites with friends. I'd like to hear what you like about tea and your most memorable cups. I'll be answering questions about Damn Fine Tea as well. No two cups of tea are perfectly alike. That's part of the allure that keeps tea aficionados Charles Andrews and Erik Dunham passionate about the age-old beverage. The two founders of the Andrews & Dunham Damn Fine Tea company also love the romance of tea, its rich history, and (of course) the taste. They take their tea very seriously and offer only a few select varieties -- but not in an exclusionary way. Charles and Erik strive to make their fine teas accessible and enjoyed by anyone, so they can share their love of tea with the world. The individual characteristics of Damn Fine Tea’s custom-blended varieties are distinct yet subtle, like the variations in fine wine. 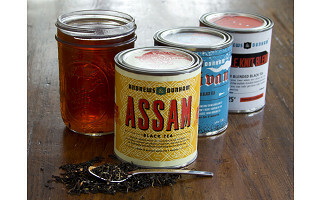 Carävan is a bold, smoky black tea from China; Assam is refined and gentle but with a hearty resiliency; and Double Knit Blend is rugged and modern. 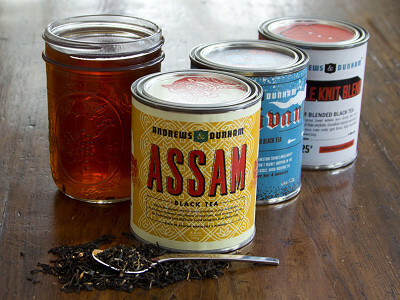 Each blend is sold loose and comes in a tin designed by graphic artists.